This product is no longer available and has been replaced by: SP20. The SP20-PW is a 20-W photovoltaic power source capable of recharging batteries. Its 15 ft cable terminates in a connector that attaches to a Campbell Scientific prewired enclosure. The connector in the enclosure then leads to a power supply or battery base to recharge the battery, allowing unattended operation of systems in remote locations, far from AC electrical sources. 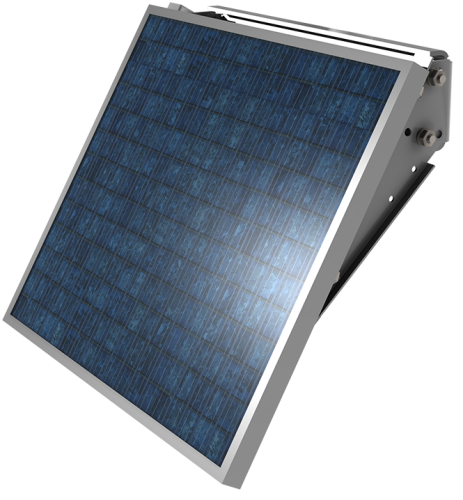 This solar panel is often used for system configurations that have higher-than-average power requirements, or in higher elevation and latitude locations. The SP20-PW includes mounting hardware consisting of the pn 17492 U-bolt and Matching Nuts. The pn 17492 U-bolt provides a 2.125" (5.398 cm) space between the U-bolt legs. This hardware allows the solar panel to be mounted to a 0.75" to 1.5" IPS pipe (1" to 2" OD). -NOTE- Solar panel characteristics assume 1 kW m-2 illumination and 25°C solar panel temperature. Individual panels may vary up to 10%. The output panel voltage increases as the panel temperature decreases. The SP20-PW is intended to recharge 12 V Gel Cell or AGM lead acid batteries such as the batteries used with the PS150, PS200, BP12, BP24, CR3000, CR5000, and CR6. It is not intended for user-supplied 12 V flooded batteries such as deep cycle marine or RV batteries. Is a longer cable available for a SP20-series solar panel? Can just a longer cable be purchased? The supplier of the SP20-series solar panels changed the wiring connections so that it is no longer possible to lengthen the cables without a splice. Splices can increase the risk of water penetrating the cable, so Campbell Scientific generally recommends not lengthening the cable. However, we can lengthen the cable upon special request. Contact us to discuss this further. Can an SP20 or SP20-PW solar panel and a CH100 be used to charge a flooded lead-acid battery (marine type)? The CH100 Charge Controller is designed to work with maintenance-free deep-cycle lead-acid batteries. The voltage of the charger is slightly different than what is required to charge the marine-type flooded-cell battery. Therefore, Campbell Scientific recommends purchasing a deep-cycle battery, such as the BP12 or BP24, rather than a flooded-cell battery. Note that our regulated solar panels, such as the SP20R and SP10R, are intended to be used with, and connected directly to, a user-supplied flooded battery. Is a regulator needed with an SP5-L, SP10, SP10-PW, SP20, or SP20-PW? Regulators control the current flowing to the battery and prevent the battery current from flowing to the charging source. These solar panels do not include an on-board voltage regulator, so a stand-alone regulator would be required to complete a power supply. Typically, these solar panels are connected to a CH100, CH200, PS100, or PS200, as well as to the battery base of a CR3000 or CR5000. The PS100 and the PS200, as well as the battery base of the CR3000 and CR5000, include an internal regulator.